Good news for all who use Gradle in their projects. 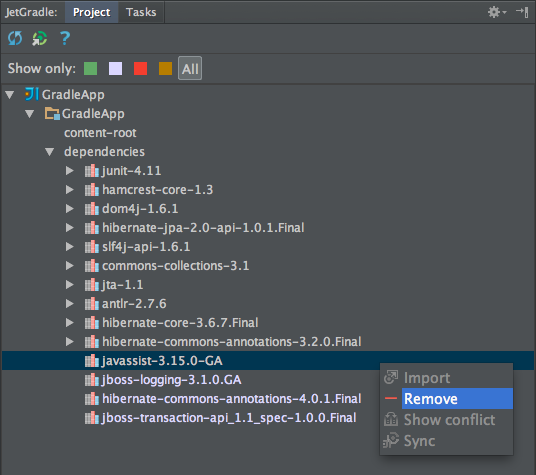 The newest update of IntelliJ IDEA brings new features and enhancements for the Gradle integration. 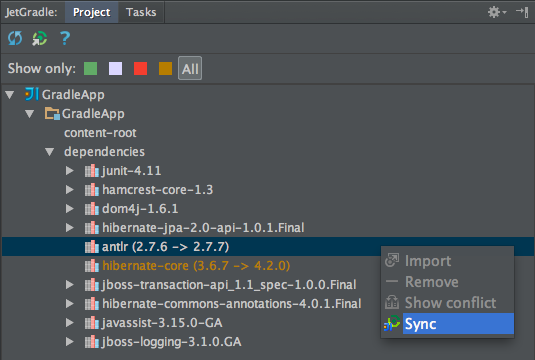 Use auto-import — Every project structure change is automatically picked up by the IDE on Gradle project refresh (e.g. when a new library is added/removed at build.gradle, it’s added/removed at the IDE as well). Note, that user-defined project changes are not automatically overwritten. E.g. when a user manually adds a library dependency to a module it’s not automatically removed during the auto-import. Service directory path — Allows to specify a location where Gradle stores downloaded library binaries. Useful for Windows’ users who may want to tune their anti-virus software. Additionally to the new settings now you can use the new actions for managing Gradle project. Now it’s possible to remove IDE’s local project entities easily from the Gradle tool window. The outdated libraries are represented now as a single node. Before this change such libraries used to appear separately in ‘gradle-local’ and ‘ide-local’ nodes. The next action allows you resolving the conflicts by applying Gradle’s values. 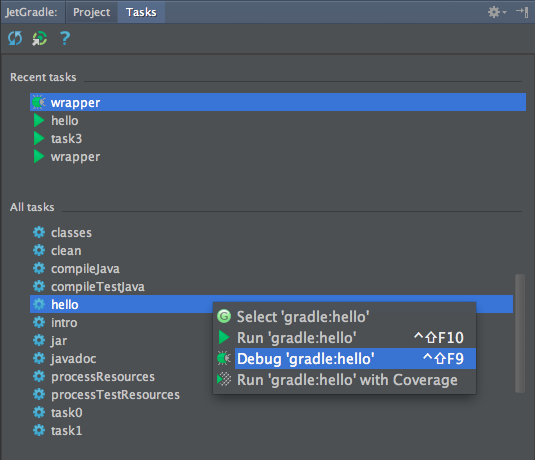 And the final new feature for Gradle in IntelliJ IDEA 12.1 is managing tasks. The list with tasks defined in the project is available on a new tab in Gradle tool window. With this new tab you can see recently executed tasks and run any of them by a double click or through the context menu. Please feel free to share your feedback at our forum and report any found issues to the issue tracker. This entry was posted in New Features and tagged 12.1, Gradle, Leda. Bookmark the permalink. regarding the auto-import: Is it a “full” auto-import? I still have to hit “refresh” upon changing dependencies in my build.gradle, so it’s not like the maven “change a tag in the xml and it gets imported automatically”-support, or am I doing something wrong? Is there any plan to make the Tasks area muti-project aware? I know it is a bit different in Eclipse, as they don’t have auto-save. But it can be done with JetGradle, just don’t call auto-refresh if the syntax in file is invalid. ‘just don’t call auto-refresh if the syntax in file is invalid’ – how do you expect us to understand if the script is valid? My projects have a lot of modules. The “.iml” files are getting generated into the root directory, which is spammy. It’d be swell if they could be generated into their respective module roots, or even better, into a directory of my choosing. I’d probably move them all under .idea/modules, out of the way. Given your previous posting about the gradle tooling api you could trigger a parse of the build file and check for some of the additional massive output to stdout/stderr. If something of the additional output that is dumped for invalid build.gradle files is present do not update the intellij settings at all. Instead mark the build file as in error. Regarding *.iml location – that is already addressed by http://youtrack.jetbrains.com/issue/IDEA-101677. Now you can choose from ‘keep all *.iml at project dir’ and ‘keep *.iml at module content root’ during importing from gradle. Ah, missed that. Very nice! IJ logs would be full of gradle api output every time a user edits gradle script then and that is unacceptable for us. I’m having a problem with my project structure. I’ve got a (legacy) java module that is build with ant, added a second module and setup a gradle build for it. Now the first module disappears every time that jetgradle refreshes. I’ve got that temporarily patched by adding gradle build and settings on a common ancestor directory. Now I tried to add a ruby module to get my cucumber going and get the same problem, but this time adding the ruby module to the gradle settings feels like going to far, plus it may (may not, have to verify) mess up some of the ruby support. Our gradle integration now assumes that the whole project is managed by gradle, that’s why it removes modules which doesn’t have gradle counterparty if auto-import is turned on. That is going to be fixed at IJ v.13 (i.e. it will be possible to have a project where not all modules are backed by gradle). Current workaround – turn off auto-import (project settings | gradle | use auto-import) and manage the project explicitly via JetGradle tool window. I’m having a tough time getting IDEA to use the Gradle wrapper. If I don’t set a Gradle Home location IDEA complains “Gradle is not configured. Do you want to configure it?” If I do set a Gradle Home location IDEA always uses it regardless of how the wrapper is configured. For example, if I have Gradle Home pointing to v1.3, but use v1.5 in my wrapper config, IDEA always uses v1.3. Since the setting for Gradle Home is grayed out when I choose “Use gradle wrapper” I assume I shouldn’t need to set it. Is there some trick I’m missing? As far as I understand this integration does not call the ‘idea’ task from the standard Gradle ‘idea’ plugin. Thus I cannot add some extra parameters to generated configuration (xml files). Could you please help me with that? Is there any way to catch an some sort of ‘event’ when project was imported and configuration files were created? @Denis: what kind of project config modification would you like to perform? Are you asking on how to tweak IJ gradle integration programatically (via a plugin)? 2) Create RunConfigurations for our project when we import it to the IDEA. The second issue can be resolved by adding to the git repo .idea/runConfigurations folder but I don’t like this solution and would prefer to generate them automatically at the ‘import time’. Could you please comment on this also: http://forums.gradle.org/gradle/topics/does_the_scala_plugin_work_with_idea ? That discussion was in place 7 months ago, but it seems to me that JetGradle still does not support Scala well. Am I missing something here? 1. I tried to import gradle project into Idea. Stuck on “Gradle home” field – it claims “Gradle location is incorrect.” Tried almost anything. I’m using Linux Ubuntu, that’s why paths are something like “/usr/bin/gradle” or “/usr/bin”. I think, this is bug. Am I right? @Denis: sorry for the long delay, just have seen your comment. So, it’s hard to customize the processing at 12.1.x. However, the whole integration has been re-written for v.13.x in order to generify external system support. Please have a look into https://github.com/JetBrains/intellij-community/blob/master/platform/external-system-api/src/com/intellij/openapi/externalSystem/service/project/manage/ProjectDataService.java, it has expressive documentation. @Oleg: there might be a bug with symlinks processing. Please try to define a path without symlinks as a gradle home. Android-specific import is performed by android plugin. That code was introduced at the IJ 13.x branch, i.e. it’s not available at 12.1.x. How to enhance the generated xml files after project import? Even in 13.1.1, we cannot modify the xml after the import is completed. Gradle Idea plugin is not invoked before or after import is complete. So please tell us how to change the project xml after the import is complete. @Denis.Zhdanov, you were right: that’s a bug with symlinks. I think, you need to file it to tracker as a feature to be implemented, because, it should automatically resolve such path problems (not only Gradle but everywhere in Idea). For those, who works under Linux, here’s the solution: imagine gradle has path “file /usr/bin/gradle”, e.g. Next, point “/usr/lib/gradle/default” in “Gradle home” (without bin). The problem is intellij is incessantly asking me to import org.apache.tools.ant.taskdefs.War, but if I do that the build fails because war doesn’t implement task. 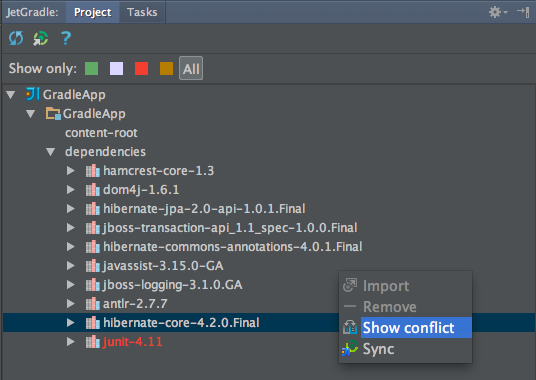 How do I turn off this import feature, or otherwise convince intellij I want the war task from gradle? Thank you for the answer. So, I guess there is no way but just wait to 13.x release. Looking forward for that! As I understand, Gradle Tooling Api allows to redirect output. Have a look at STS Gradle plugin, it works just fine, without verbose output, it runs on update, either when build.gradle is modified explicitly or with git pull/rebase. @Andrey: have you read the mentioned ticket I’ve created at gradle tracker (http://issues.gradle.org/browse/GRADLE-2687)? It explicitly points that setting stdout/stderr via gradle api doesn’t suppress all problem output. The problem is not that we can’t automatically refresh project info on gradle script modification, the problem is that IJ logs would be full of garbage as gradle scipts have invalid state most of the time during editing. Am I correct that IDEA isn’t properly handling the ‘buildscript’ section for dependencies? In my projects, if the dependencies are only on the buildscript (and not the project), Intellij doesn’t see them and assumes everything is an error. The JetGradle / Gradle in IntelliJ is broken for my Java EE 7 book that uses multimodule. Whenever I open now a sub module say javaee7handbook/ch04/jpa-simple/build.gradle I find that IntelliJ replicates the whole structure inside the sub module!!! 1. What do you mean by ‘open a sub module’? Do you perform ‘import from gradle’ for it? 2. Could you try IJ 13.x EAP and check if the problem persists (http://confluence.jetbrains.com/display/IDEADEV/IDEA+13+EAP)? We user IDEA 12.x Ultimate along with gradle. The Jet-Gradle plugin autumatically refreshes the project dependencies every time a project is opened. Is there a way this can be disabled so that refresh happens only when user needs ? 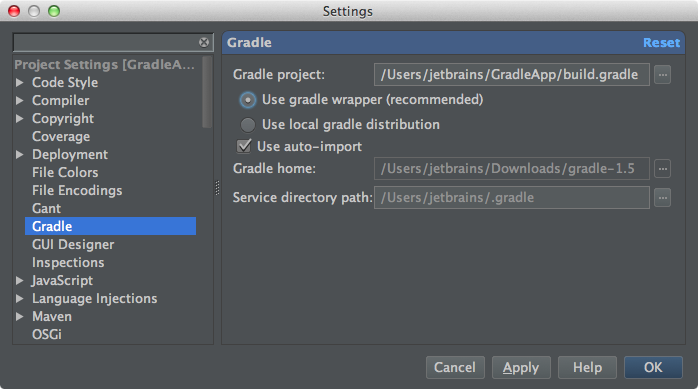 The gradle home path is correctly set in intellij settings. Can we expect Gradle support in WebStorm soon? Any word on timeline? Still cannot support “apply from” in build.gradle? Main reason i’m not switching to gradle is poor support in my favourite IDEA.